What is the difference between face value and place value of digits? Before we proceed to face value and place value let us recall the expanded form of a number. We read it as five hundred thirty four. We read it as seven hundred ninety eight. For example similarly, all numbers can be written in expanded form and read accordingly. The digits of a number express the values of their own when the number is given in expanded form and read in words. The value of a digit when expressed in expanded form of the number is called its place value in the number. Thus, the place value of a digit in a number is the value it holds to be at the place in the number. 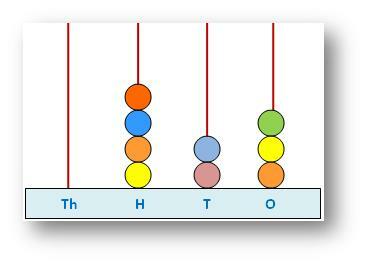 If 5 is at Thousand-place in a number, its place value will be 5000, if it is at Hundred-place, its value will be 500, etc. In the number 2137, 2 is at Thousand-place, 1 is at Hundred-place, 3 is at ten’s-place and 7 is at one’s-place. So, the place values of the digits 2, 1, 3 and 7 are 2000, 100, 30 and 7. The face value of a digit is the digit itself, at whatever place it may be. It is unchangeable and definite. But place value changes according to the digit’s place. The face value as well as place value of zero (0) is always (0). We used the spike-abacus to show, to read and to write a number properly. Now with our knowledge of the values of the digits we read and write the numbers without the help of an abacus. This abacus shows the number 423. It is read as, four hundred, twenty and three or four hundred twenty three.